The Hitachi NR83A3 was introduced in 2013. It is one of the newest pneumatic framing nailers to hit the woodworking scene. This model works with standard 2 - 3-1/4 inches round head nails in a plastic-collation and has attractive features that can potentially make you more productive on the job. It can even cope with heavy-duty nailing easily due to its beastly power. But is this high-profile framing nailer right for the job or are there better options out there? Over the past few years, the Hitachi NR83A3 has become synonymous with power. Indeed, many customers have claimed that this high-profile pneumatic framing nailer can nail in any type of lumber without breaking a sweat. It is also very efficient, and all it requires is a modest 70-120 PSI from your air compressor to operate. What is great is that you can adapt your nailing quickly and easily by using the selective actuation switch. This switches the machine from sequential to bump mode in a matter of seconds. The penetration force of this model is powerful enough to make it nail quite effectively in even high-density material like metal sheets. Furthermore, for added performance, you can adjust your air compressor for even more penetration power. This model is one of the fastest pneumatic framing nailers out there and has a rapid fire rate of 3 nails per second. It is very similar to the agile battery-powered Paslode 902600 CF325Li in terms of firing speed, but more powerful. The magazine is made from a durable 2-piece steel with a generous nail capacity. It's good to note that this model works exclusively with 2 - 3.25 inches plastic collated round head nails. Those nails are cheap and easily available in any hardware store. 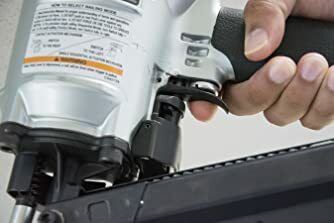 Best, the magazine has a rear reload mechanism which makes it easier to replenish nails than side loaded magazines generally found in most framing nailers. Additionally, the 21-degree magazine slant gives you a clear view of your nailing which helps boost your overall accuracy. There are many user-friendly features in this pneumatic framing nailer. It is not the lightest nailer out there, even if Hitachi says that it is “lightweight”. At 8.6 lbs, there is definitely some weight to it and it is bulkier than other well-regarded pneumatic framing nailers like the Porter Cable FR350FR3. However, despite its extra pound, the low form factor of only 15.5 inches makes this model very compact and it feels extremely well-balanced in the hand. The short height of 15.5 inches is also very handy when power nailing in tight spots or awkward positions. To add sugar on top, the handle is coated with a thick elastomer coating which makes it very comfy to hold and use for long hours. Coupled with that, the general ergonomic form factor and low height of this framing nailer help prevent hand fatigue over time. Comfort and ease of use is definitely a big factor with this model. The hardened toe claw is highly-durable and the sharp tips dig well in material, allowing you to get more accurate nailing in material like engineered wood. Furthermore, the claw also helps provide better stability when nailing at odd angles in wood. A small caveat is that the pointy toe is not ideal for nailing in metal sheets as it can get quite slippery. This framing nailer is mostly suited for wood nailing until stated otherwise. Lastly, the Hitachi NR83A3 works in both sequential and bump mode. In bump mode, simply press the nose against the material to trigger the firing mechanism. It is ANSI compliant, which means that it will work every time it is actuated - even if you fire it a thousand times. 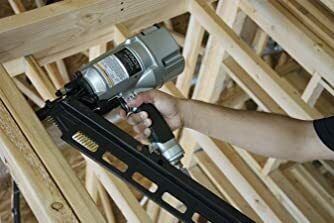 Overall, this framing nailer fits well in the hand and despite its relatively bulky weight, it feels well-balanced and performs satisfactorily even when held with one hand. It is also a solid performer in tight spots. Toolless Depth-of-Drive: Hitachi sells this model with or without a depth adjustment. The model with the included depth adjustment is a little bit more expensive. Adjusting the nail depth is very easy and all it takes is turning the depth-of-drive knob at the front of the device. Open Nose Design: The open nose design is a feature we wish to most framing nailer manufacturers would start implementing. Clearing a jam in the NR83A3 is very easy, and all you will have to do is simply twist the nose for the stuck nail to pop out. The price department is where this model is a terrible turnoff. It is offered at a quite expensive price for a pneumatic nailer and can even be mistaken for a gas-powered nailer like the Paslode 902600 - which is generally more expensive due to a more complex inner design. Even purchasing the model without the standard depth-adjustment option it is still quite pricey, as you save only a few dollars at most. On the bright side, if you can afford it, it will perform exceptionally well and in our opinion handles even better than the excellent Porter-Cable FR350B. It is more solidly constructed than most nailers and it is apparent that Hitachi is banking everything on the high-quality build and rapid-fire mode of 3 nails/second. It is quite durable and should definitely last a very long time, even if abused every day. Solid and premium build quality. Powerful and works with any air compressor that can deliver 70-120 PSI. Well-balanced and comfortable in the hand. Rapid fire mode of 3 nails per second. Easy to switch from bump to sequential mode with the push of a button. Hardened claw for better grip, stability, and accuracy. It is hard to recommend the Hitachi NR83A3 to everyone in need of a performing framing nailer. Don’t get us wrong. It performs exceptionally well on the job and feels great in the hand. The rapid-fire of 3 nails/second is very handy when you have to nail a lot of lumber fast. The only problem that we have with this model is the price. However, if the price is a non-issue and you are looking for the best of the best in terms of performance and reliability - we feel that the Hitachi NR83A3 is an awesome pneumatic framing nailer. Make sure to get the model with the depth adjustment for a few extra dollars if you decide to grab it; as it will make this unit more versatile and easy to use.